What’s on your bookshelf right now? Have you read any creative books lately that make you feel alive, help you become a better parent, or inspire you to grab life by the horns? Yesterday I shared on Instagram and Facebook that I just acquired a new book, and I was looking for feedback on it. In the process of this, I had a question about sharing what’s currently on my reading list. This list has already been brewing in my mind, so here it is for your inspiration pleasure. These are all books that I’ve acquired or started reading in the last month, and that I hope to read in the first part of the new year. 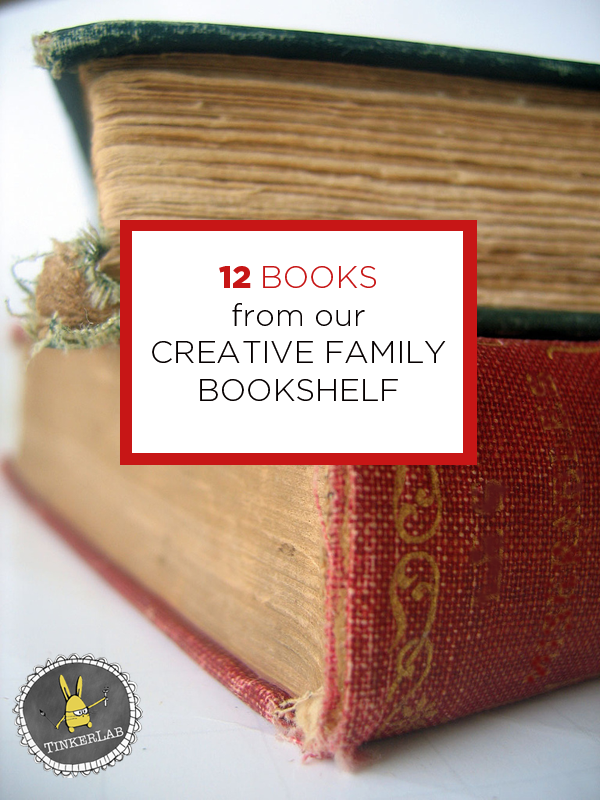 The theme that runs through this list, is that most of these books focus on parenting, making, and creativity. You should also know that I’m in a non-fiction state-of mind, so there’s just one fiction book on the list. If you have a favorite book that you think we’d enjoy will you add it to a comment? 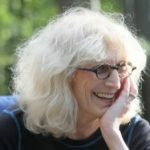 I and other readers like you are looking for more good ideas. Don’t be shy! This post contains Amazon affiliate links. If you purchase through these links I’ll receive a small percentage at no extra cost to you! This book was just sent to me to review, and OH-MY-GOODNESS, it’s a winner. It’s not technically available to purchase until February 4, 2014, but I’ve heard that the Exploratorium book store will start carrying it sooner than that. If you’re in the SF Bay Area, you might want to seek it out sooner. My husband and I were gifted with a a daytime date over the holiday break, and what did we do? We spent two hours milling around a bookstore 🙂 This is one of the books that I purchased. This book isn’t out yet, but I’m so excited about it that I pre-ordered it. 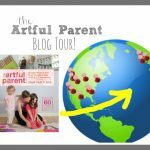 Written by Danielle Krysna, writer behind one of my favorite blogs, The Jealous Curator, who interviews 50 artists about their creative process and how they get things done. I’ve been looking for a book like this for ages and I’m so glad that Krysa is making it a reality. I’ve had this book for over a year, but I’m dusting it off now because we’re kicking off the new year with it as our trusty outdoor exploration manual. 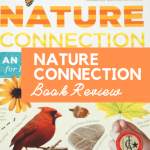 If you’re interested in raising children who have a strong connection to and appreciation for the outdoors, this book is worth looking into. My kids have responsibilities, but at 3 and 5 they’re far from taking on chores like cleaning the bathroom or making an income. I’m also not very organized about helping them tackle chores, so I picked this up as a roadmap to help me set up practical tools for fostering good habits in my children. You might enjoy reading the Facebook comments if you’re thinking of getting this book. Back when I was child-less I liked to keep extensive, detailed journals. Um, that’s pretty unrealistic now that I have two kids and barely a second to myself. For memory-keeping, I like that this book only requires me to write down one or two sentences for each day. Oh money, why are we not better friends? I’m sadly lacking in finance skills and get all jittery when I think about balancing my checkbook or investing in my future. Brrr. Chills. Because I know that my kids will likely learn money skills from their parents, I’m nervous for their financial intelligence. This book got amazing reviews and I love the smart skills I’ve read so far. I grew up in a fun-loving Southern California family, and I’m a solid Disneyland fan as a result. This book was written by my friend Cam, who happens to be a Disneyland expert and runs a great Disney site called Growing Up Goofy. Her family has season passes and they visit with their 3-and 5-year old frequently, and all of her advice is tested and solid. If you’re planning a trip to Disneyland with small kids, this book is full of useful tips. Cam is also running a book giveaway on her site (closes on January 2, 2014). And this is the other book I purchased on that lovely afternoon date! It’s so inspirational for anyone who wants to live a more interesting life. 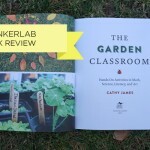 As a home-grown city girl, living in suburbia, this is a book I need. This is my one fiction book. Someone recommended it to me. I can’t even remember who now? It’s about a blogger, which is probably what prompted me to pick it up. Chris Guillebeau, NYT bestselling author of The $100 Startup says of this book, “You have a limited number of days on Earth. This book sends an urgent message: make them count!” It’s that limited days thing that really gets me, and I’m always thinking about how I can get the most out of my short life. I really like this book so far. I follow Guy on Google+, and he’s one smart cookie. He’s also published a gazillion books, and in this one he explains why and how to publish an e-book. This is something I’ve been thinking about doing for a while, and I hope that Guy can guide me through the steps of this process. 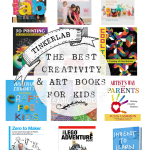 For more creative reading ideas, check out our recent list of the Best Art and Creativity Books for Kids. Thanks for the list. Straight to the library website to do some reserve placing with this list for me. Great variation in topics too, some for me some for whole family to benefit. Now to find time to read in peace! Thanks for all the wonderful resources! I just published two books designed to use reading together to help families begin creating together too. “Oops Paint” for ages 2-5 is an adventure in printing. Family members keep dropping things in the paint and readers turn the page to discover the interesting prints the objects make. 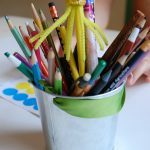 “Collette A Collage Adventure” for ages 4-8 is the story of a bottle of glue who feels left out in the painter’s studio until a visit from a young girl helps her discover the creative potential of collage. 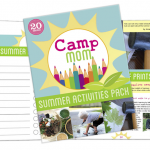 Both books include letters to parents with ideas for getting started with collage and printing at home using everyday materials and recycled objects. 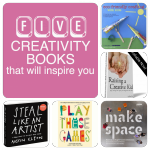 thank you so much for including my book in this lovely list… i’m honored! Danielle! Can I just tell you how excited I am to see your name pop up on my site?! And I’m so sorry about your name — it’s now corrected. Of course I now have your book in my hands, and I love it even more than I expected. Bravo on creating something that’s both beautiful and full of substance. Hopefully we’ll meet one of these days.